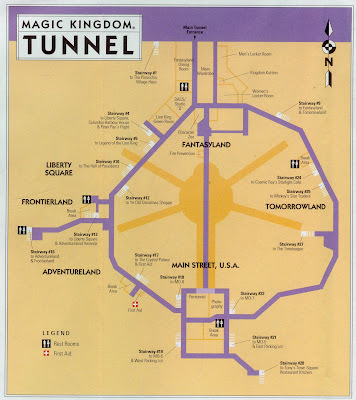 Maximizing Progress: Disney's Utilidors ~ Magic Kingdom Tunnels! "...when plans for Walt Disney’s second theme park in Florida were being developed, the Imagineers decided to design a system of tunnels under the park so that cast members and service people can travel from land to land without being seen by guests and thus help keep the magic in place. It was deemed an ambitious project at first, however, the creators were able to realize their tunnel designs. These tunnels would come to be known ads “Utilidors” short for “utility corridors." The first amazing fact about these “underground” tunnels is that they are not underground at all. While it is true they lie underneath the Magic Kingdom in Walt Disney World, they are actual on ground level. The Magic Kingdom is built on top of the tunnel system." Many more interesting details, including a walkthru... And here's a map of the underworld... And here's Disney's own Fact or Fiction revelation!